This model is great for many electrical applications. It is a fast and cost effective machine with great speed and accuracy to meet all your business needs. You can do a variety of cutting and stripping programs to customize your job by simply adjusting quantity, stripping length, etc. on the LCD display screen. SEVERAL STRIPPING OPTIONS: This machine is capable of full stripping and half stripping. The stripped length for the wire head and tail is 0-35 threads/0-15 mm. Program up to 10 cuts for middle stripping on each wire segment. MANY USES: This automatic wire stripper and cutter is easy to setup, use, and maintain. This unit strips many different kinds of wires including those with PVC, Teflon, Silicone cable, and fiber glass insulation. 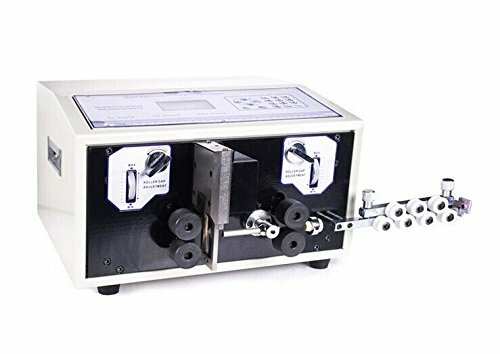 PRODUCT FEATURES: Blue LCD display screen with options of up to 99 separate cutting programs, 0-9 speeds for an output of 2,000 to 5,000 pcs/h, Maximum cutting length of 9999 mm (10.9 yds) with a cross section diameter of 0.1-8 mm2 (AWG8- AWG30). High Quality Tungsten steel cutting blade. SHIPPING: This 110 V unit ships from our Cleveland, USA warehouse with an estimated delivery time of 4 to 7 business days for most locations. Each item comes with tracking information and EXPEDITED shipping is available for an additional fee.